Give your members an Augusta-like experience with buttery-smooth hole tours. With a flight path much like that of a golf ball, our drones highlight every feature of your course with crystal clear video. 3D models can play a key role in online promotion. 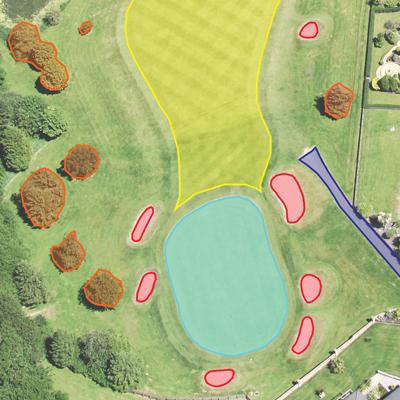 As part of their online marketing and communication strategy, golf course owners are adopting interactive 3D models as a tool to engage their audiences in a process of discovery. Players count on golf course superintendents to keep greens healthy and consistent so that they can enjoy the best green speeds and performance. But keeping greens healthy is no small feat. If maintenance staff can spot damage from an irrigation problem or a fungus with the naked eye, that usually means the problem has already become significant and may take weeks to fully correct. “Course Managers can look at that stubborn pine tree on hole #4 and accurately calculate the height and width of the tree, estimate the weight of the tree, and the cost and time it would take to remove it,"
Highlight and calculate sqft of fairways, greens and tees. Drone technology can provide essential feedback on golf course turf problems that may arise from pests, disease, invasive weeds and stress to greens, fairways, rough, shrubs and trees long before the naked eye will notice. Multispectral sensing targets areas of the light spectrum related to plant biology. Plants reﬂect light differently depending on factors such as growth stage, level of stress, or impact from disease. Multispectral sensors measure this difference. By comparing the red band of light with the near-infrared band, multispectral data can quickly classify areas of the course that may not be visible to the naked eye. Get in front of yellowing or browning spots before they become a bigger problem. Texas Drone Company allows you to know the square footage of different turf types, water features, hazards and other surface materials on your course. These precise numbers allow your cost breakdowns to become easily managed while giving you insight to specific costs for specific applications. Additionally, establishing a baseline for properly determining pre-storm damage can increase payout for a documented loss. Monitor fairway health like never before with monthly flights that pinpoint vegetation issues before they become problems. 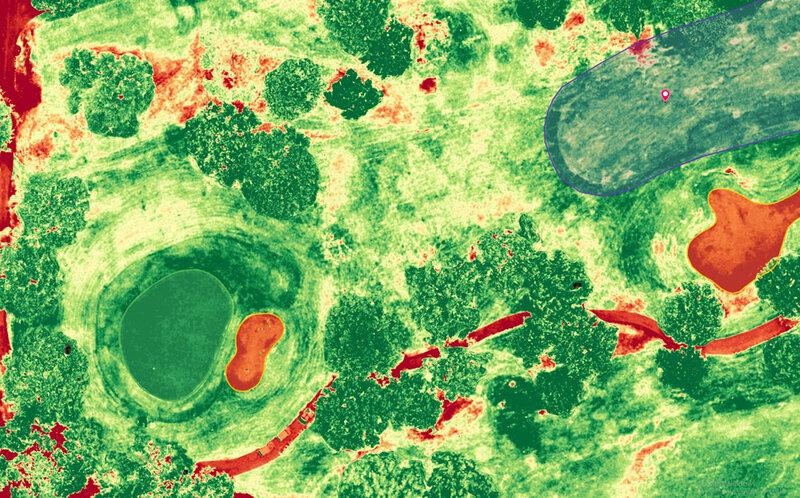 Orange ares on the multi-spectral image show stressed vegetation. These insights can lead to quicker treatment and better health of the course. With large aerial maps in your ofﬁce, you’ll quickly plan your day with visuals and train your team with proper technique on things like bunker grooming and equipment use. Monitor irrigation to properly identify areas of the course that sprinklers may miss or where drainage is not working correctly. A detailed historical representation of how your golf course matures over time can quantify your hard work & improvements. 3D models are also a game planning tool. Last but not least, golf is a game, and players need tools to to define a strategy. With accurate interactive 3D models. Golfers can plan their rounds in advance: preparing their approach to each hole before they actually step on the green.